Today, for the first time, I am going to present to you factually false information on my blog. I do not know which information is false but I have received a lot of conflicting information from various places. My colleagues, which are not an exclusive group, are working together with the whole industry to help stay the damage by working on positive messaging. These organizations are open to anyone who wants to step up to the plate in the industry and invest their time and money. This came after the email from Keith Myers who said that the Alliance for Home Health Quality and Innovation are not in the business of lobbying. I took Bill’s note on ‘positive messaging’ to be a euphemism for lobbying so I contacted him and gave him a chance to clarify his position. Bill also received Keith Myers response to my original post which stated emphatically that no lobbying or legislative activity occurred. That resulted in a phone call from Bill last Thursday. During that conversation, he was adamant that Keith was one hundred percent correct. He also said that perhaps I was confused. There are and were multiple organizations out there and perhaps, I found information about the wrong group. It is a sad fact for me that such a scenario is extremely possible so I found the lobbying reports forwarded them to Bill. It was not my goal to discredit him personally so I offered him an opportunity to reconcile the lobbying reports with his position. I did not hear back from him until late Friday afternoon. See for yourself if he explains the lobbying reports. Last week, Reuters published an article that quoted me as calling for the government to provide home health providers greater clarity concerning reimbursement rates, in which the reporter noted that Amedisys and other publicly traded home health providers were lobbying Washington to accelerate the rebasing process. This article has generated a lot of attention, and I have received many questions seeking greater clarity concerning my comments. Accordingly, I wanted to take this opportunity to clarify my position regarding these matters. As you may know, a report by the Moran Company from earlier this month analyzed the potential impact of CMS’ proposed 2012 reimbursement cuts and concluded they would lead to negative Medicare financial margins for 52.3 percent of all home health agencies in the U.S. This report can be found on NAHC.org. As the Reuters article reported, it is true that several members of the home health industry have formed the Alliance for Home Health Quality and Innovation dedicated to improving the nation’s health care system by supporting research and education to demonstrate the value of home-based care. However, the lobbying efforts referred to in the Reuters article were not, as stated in the article, undertaken by the Alliance, but rather by another group called The Partnership for Quality Home Healthcare which represents more than 1,800 community- and hospital-based, non-profit and propriety home health and hospice agencies nationwide and NAHC to develop innovative reforms to improve the program integrity, quality, and efficiency of home health care for our nation’s seniors. Amedisys supports both the Alliance and the Partnership, and has also been a long-standing supporter of NAHC, which represents all home health care providers. We invest our time and energy in these efforts to protect patient access to home-based health care for the more than 3.2 million Americans who rely on us. In doing so, we improve patient lives and the health of the Medicare system by keeping our nation’s chronically ill seniors out of the hospital and other more expensive facility-based settings. The point I made to the Reuters reporter is that, despite the significant cuts in 2011 and 2012, our industry continues to face additional threats from many different sources, in the form of rate cuts, accelerated rebasing and calls for the implementation of co-pays, leading to great uncertainty about the future. Without a predictable and reliable long-term source of revenue, it is very difficult for any company—large or small—to form or implement a successful business plan or make the long-term investments necessary to support a healthy, sustainable organization. In speaking with the Reuters reporter, I was speaking on behalf of myself and Amedisys only, not on behalf of the Alliance, the Partnership, NAHC or any of my colleagues. I personally support the effort to press Washington to provide our industry with a comprehensive reimbursement plan that we can be certain will be in effect for the long term. We deserve clarity on just how far the cuts will go. We need clarity so that we can plan ahead for mission critical business decisions such as hiring talent and investing in new clinical programs. If we leave rebasing totally up to CMS, each year through 2017 we will be forced to operate in uncertainty, taking us away from investing in patient care and instead worrying about which shoe will drop next. This uncertainty is simply not tenable—for any of us, or for our patients. In my opinion, without the type of proactive initiative being spearheaded by the Partnership, we will certainly get an additional reimbursement cut in 2012, and again in 2014 when mandatory rebasing is implemented. The intent of my statement was to have the industry endure only one reimbursement cut, that we would have a say in and that would take place now, and that would be in effect for the long term, so we can operate our businesses with some certainty and confidence about the future. I invite and encourage all home health care providers to help our industry by being active with any of the organizations formed to help increase awareness around the work we do helping and healing people each day. We should not be divided. We need to have a joint effort to protect home health care. Our patients are depending on us to come together and protect their access to care. William F. Borne Chairman & CEO, Amedisys, Inc.
As mentioned previously, there is something factually false on this blog. I am not in a position to know if Bill, Keith or the Lobbyists in Washington are the ones who have provided factually false information. Bill and Keith can’t seem to get their stories to correspond on whether or not the Alliance actually engages in in any political activity or lobbies. Read Keith’s very clear statement about the Alliance here. If you read Bill’s statement carefully, you will see that he didn’t actually deny that the Alliance lobbied. He said, “However, the lobbying efforts referred to in the Reuters article were not, as stated in the article, undertaken by the Alliance, but rather by another group called The Partnership for Quality Home Healthcare.” So if the Alliance didn’t take on lobbying efforts referred to in the Reuters article, what efforts did they undertake? 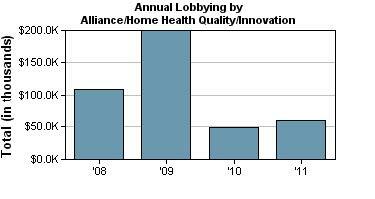 Here is the lobbying budget for the Alliance of Home Health Quality and Innovation for the past four years. This is the composition of the Alliance of Home Health Quality and Innovation from their form 990 filed in 2009. 2009 was a transition year for the Alliance. The Alliance has reorganized its working groups to address: research, education of policymakers, internal and external communication, memberships, relationships with other professional organizations, quality and technology and innovation. It also established working relationships with key policymakers at CMS, MEDPAC and other public and private organizations. The Alliance has also held educational sessions for federal officials on the value of the home health benefit. My understanding is that lobbying is an effort to gain political influence. Truthfully, there is nothing wrong with that. When a group of passionate people who openly state their purpose and do their best to persuade policy makers to make changes, the results can be amazing. Going back to that little form 990 again, we see that simply joining a group does not give you an opportunity to facilitate change. The Alliance shall have two classes of members: once class of members with voting rights and the other class without voting rights. Only members with voting rights may designate a representative who shall be eligible to be elected as a Director (it being understood that not all voting members shall be entitled to have a representative to serve as a Director). The board of Directors may establish different dues categories and member designations in each class and shall otherwise determine all other rights and obligations of the members. The Alliance also had to list its board members on the IRS form 990 in 2009. This is taken from the IRS form 990 which exempts this organization from paying taxes. Keith Myers signed the form. How can the lobbying reports be reconciled with the statements Bill and Keith made? Is there a meaningful difference between ‘establishing working relationships with key policy makers at CMS, MEDPAC and other public and private organizations’ and lobbying? Bill states the Alliance is open to all. I have a whole lot of emails from home health agencies all over the country who state they never heard of it until last week. If it is open to all, how much does it cost to join? How much does one have to pay for voting rights? What did the current members pay and is that public information? Does NAHC have voting rights? If so, on what scale? If the voting rights of NAHC are proportional to Amedisys and LHC representatives, it stands to reason that the entire industry is not being represented proportionally. If so, the name of the organization should be changed to, ‘Alliance of Really Big Home Health Companies’ . If any topic arises that NAHC could be outvoted on by the large corporate entities, NAHC doesn’t belong in the Alliance, period. That’s Julianne’s opinion. No one else’s. Do the members of NAHC know that their organization is part of a small group of very large players chaired by Bill Borne? How much of NAHC’s membership dues went to pay the dues for being a member of the Alliance? Bill proudly states that the Partnership for Home Heathcare represents more than “1,800 community- and hospital-based, non-profit and propriety home health and hospice agencies nationwide and NAHC ….” If you add up the number of agencies owned by Amedisys, LHV, Gentiva, Almost Family,Bayada and the VNA, I wonder how close the total is to 1800? NAHC has 33,000 members according to their literature. Which ones did NAHC choose to support? Why is the Alliance for Home Health Quality and Innovation not listed on the NACH website under the affiliated organizations page? Oh, and can somebody tell me who the Partnership for Quality Home Healthcare is? The information I know for certain is that they have a very large lobbying budget. Nowhere on their website is the name of a manager, director, contact person, etc. mentioned. Would the Avalere study emphasizing the benefits of home health have been more credible if the members of the Alliance hadn’t have paid for it? It is understood in academic worlds that conflicts exist but conflicts of interest do not discredit a study nearly so much as the non-disclosure of said conflict. By hiding behind the cover of the Alliance, a very expensive study was paid for by the largest home health care companies in the US. I think that is relevant information. As interesting as these questions are, nobody owes me an answer. It is the agencies who compete against the larger publicly traded companies that need answers. It is the 3,3000 home health agencies who are NAHC members that deserve to know these answers. I encourage your comments. However, since this is my domain, I could be held responsible for anything published here. I will withhold any comments that are overly insulting to any one individual or that make accusations that I cannot independently verify. My goal is not to ‘attack’ any one individual or company. My goal is to alert you to the fact that we have a limited number of large organizations, including NAHC that are making decisions for us all. We have a ton of stuff to get done in the next couple of months in order to prepare for 2012. But as far as this blog goes, it’s time to turn our focus back to what really matters. We have to take care of our patients and keep them out of the hospital. We have to endure cuts in payment but we will not compromise care. We are nurses and given a roll of duct tape and a paperclip, we can bandage wounds, perform emergency tracheotomies, kill germs, and keep our patients quiet so we can provide the covered skill of teaching and training. perhaps Mr. Borne id having a difficult time getting his thoughts/story straight at it was very publicly announced at the NACH conference that Amedisys has been and continues to be under investigation??? A 600 page report was published by the Senate Finance committee earlier in the week. The good news is that Amedisys, LHC, Gentiva and Almost Family are no longer under investigation. The bad news is that the Senate Finance committee was none too happy with their business practices. It makes for interesting reading. To be certain, the practices of these larger companies were extreme but I caution that their attitude towards therapy thresholds is not uncommon. We all need to make sure we are doing the right thing. I thought the reuters report was very clear that Mr. Borne was hoping that smaller home health agencies would be forced out of business by the cuts so he could start “acquisitions” to make up for his lost revenue. In my opinion all the statements above are a smoke screen to cover up his true intent. He just didn’t count on the reuters report coming back on him like this. I found this post and the others related to it to be an extremely interesting. I see what you mean about getting the answers to some questions cause others to arise. The follow-up questions put forth on behalf of all the agenices that make up the larger portion of the home health care community definitely deserve answers and clarification from Amedysis, the LHC Group, and the NAHC organization. Reading the recent posts coupled with the information outlined in the Senate Finance Committee Report has certainly made for interesting reading and led me to form a question of my own. In light of Senate Finance committee’s conclusion that these companies wasted millions of medicare dollars, as evidenced by their data and business practices which they disclosed in response to the investigation, how can it be possible that the members of congress at whom these companies’ lobbying efforts are aimed be so completely blind to the irony that these very same groups are representing the home health care community in spearheading program integrity and reform? It does appear that the reforms they are promoting are needed and can lead to improving the home health care arena, yet one cannot help but wonder at the source as well as wonder why these companies didn’t exercise the program integrity practices themselves and avoid the investigation altogether (which unfortunately seems to have cast a pall over the home health care community as a whole). Mr. William Borne’s request to work together jointly to protect patients access to care is important yet I see how it can be viewed as suspect by the majority of agencies that until just recently appear to have been kept in the dark about the lobbying activities and intent of The Alliance and The Partnership for Quality Home Healthcare. As an outside observer, these particular companies proposing program integrity could be deemed comical, if I did not have the feeling that what may really be occurring is a tragedy in the sense that Washington’s “blindness” is due to their seeing only the money thrown at them by lobbyists, the publicly traded home health companies are blinded by the finanical bottom line, combined with the possiblity of these companies are couching their true intent and self interest as working to improve “program integrity” and as such bring forth legislative decisions that could negatively impact the home health care provider community and a patient’s access to care.